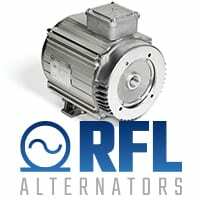 Based in Sydney Australia, RFL Alternators Pty Ltd is a world class manufacturer of high quality permanent magnet alternators for the power generation industry. With over 25 years of investment into research and development, RFL prides itself in continuing to develop new and efficient cutting-edge technologies and products which are at industry’s forefront, and manufactures alternators to the highest of quality standards. The objective of the blog is to give a deep understanding of Permanent Magnets, the modern industrial applications, demand and supply drivers. Permanent magnets are a vital part of modern life. They are found in or used to produce almost every modern convenience today, from speakers in mobile phones to the electric motors in hybrid cars; air conditioners and washing machines. Permanent magnets are used increasingly in technological applications, including traveling wave tubes, Hall Effect sensors, high temperature-resistant permanent magnets, thin-film coating equipment and flywheel storage systems. Centuries ago, it was discovered that certain types of mineral rock possessed unusual properties of attraction to the metal iron. One particular mineral, called lodestone, or magnetite, is found mentioned in very old historical records (about 2500 years ago in Europe, and much earlier in the Far East) as a subject of curiosity. Later, it was employed in the aid of navigation, as it was found that a piece of this unusual rock would tend to orient itself in a north-south direction if left free to rotate (suspended on a string or on a float in water). A scientific study undertaken revealed that steel could be similarly “charged” with this unusual property after being rubbed against one of the “poles” of a piece of lodestone or temporary magnets. Unlike electric charges (such as those observed when amber is rubbed against cloth), magnetic objects possessed two poles of opposite effect, denoted “north” and “south” after their self-orientation to the earth. It was impossible to isolate one of these poles by itself by cutting a piece of lodestone in half: each resulting piece possessed its own pair of poles. A Permanent Magnet is made from a hard-magnetic material whose atoms have been permanently aligned during manufacturing. Permanent Magnets maintain this intrinsic magnetism over long periods of time. An electromagnet is created by running a current through conductive wire that is tightly wound around a piece of soft magnetic material. The magnetic field stops when the electrical current ceases. The basic operation of generators and motors relies on Faradays law of induction which predicts how a magnetic field will interact with an electric circuit to produce an electromotive force (EMF). A magnetic field is thus required to create electrical power in generator mode, or to create work in motor mode. These magnetic fields can be generated by either permanent magnets (PMs) or electromagnets. This blog will give a brief description on the differences between the two along with their associated advantages and disadvantages. The main benefit to using an electromagnetic is in the ability to control the resultant magnetic flux. This can be done by either turning the magnet on and off or by adjusting the current through the coil. This is an ideal characteristic for maintaining voltage regulation where the electromagnet operates as a generator. Electromagnets also possess the ability to create greater pull strength than permanent magnets. As the name suggests Permanent Magnets maintain a permanent magnetic flux, hence limiting the flexibility associated with voltage control whilst operating as a generator. A key benefit of PMs is that they are capable of operating at a peak efficiency at all times. Loss of Magnetism – A myth or fact! It is a common notion that permanent magnets lose their magnetism over a period of time. Although this is not at all true, there are conditions which may result in loss of magnetic properties. We conducted a lot of temperature tests on the RFL alternators and other alternators / motors using surface mounted design. The case temperature and the rotor temperature stabilize after about 1 Hour running at full load. The PM temperature range is about 120 degC and although our alternators are air-cooled, we have never registered temperatures beyond 100 degC. However, this may not be the case with alternator design where the Permanent Magnets are surface mounted. At this temperature, the magnets can be susceptible to short circuit load conditions damaging the magnets. We have tested many other pm designs and have found these units to be prone to magnet damage under short circuit load conditions. High loads or motor starting can demagnetize the magnets in surface mount pm designs even at magnet temperatures well below the PM temperature rating. For example – DOL motor starting of AC motors. This is effectively a short circuit and as such many PM designs have problems starting AC motors. The RFL design does not have these problems. The motor starting ability is equivalent to a standard induction alternator with a pm exciter. The patented positioning in the RFL Alternators means that magnets are protected from flux loss under short circuit loads, even at elevated temperatures. This is a key advantage of RFL design. We have also tested the RFL design with magnet temperatures close to 100 degC, at short circuit conditions many times and no flux loss has been registered. Due to the patented imbedded design, The RFL unit does not have this problem. In fact, we have had zero rotor failures to date. Our largest four pole customers are reefer industry generator set manufacturers. We have produced over 2000 units for these clients. This application requires constant starting of refrigeration compressors at high temperatures and for long periods of constant operation (weeks without stopping). RFL Permanent Magnet Alternators have had not a single failure in this application. There are a number of major families of permanent magnets available for designers, ranging from ferrite, known for its low cost and low energy, to rare earth materials, which are more expensive and offer higher performance. Designers need to analyse magnetising field strength and magnetic output of magnetic materials prior to deciding on the appropriate magnet. pole pitch. This will increase the electrical frequency. The availability of Permanent Magnets in very small dimensions make them ideal for size-limited applications, or for a lightweight man portable application. In the case of electromagnets size prohibits applications. Cooling requirements further limits the portability of electromagnetic machines. Electromagnets require a DC power source in order to create the magnetic field, subsequently producing heat that requires removal. The main advantage of Permanent Magnets over electromagnets is that the Permanent Magnet does not require a continuous supply of electrical energy to maintain its magnetic field and consequently generates no heat. This makes the Permanent Magnet the clear winner in this field. With electromagnetic generation, a high source impedance exists. When operating at a full single phase load the input impedance (that of the electromagnet) becomes measurable with that of the phase impedance; this will naturally cause a high voltage variation. Eventually this could burn out both the rotor and stator winding. Suppliers tend to use an Automatic Voltage Regulator (AVR) to overcome this, adding cost and complexity to the design. With the use of PM machines, a load on one phase does not cause adverse effects on the other 2 phases. Scientists use four basic ways to categorize magnets, based on how their magnetic force is used. Category 1: The magnet’s attraction or repelling force. These applications are the simplest use of magnets. A simple refrigerator magnet is a perfect example—a picture or slogan on a small piece of laminated cardboard with a small bar magnet glued to the back which attracts to a metal refrigerator door. Category 2: The magnet’s ability to convert electric force into mechanical force. Electric motors are good examples of using magnets to convert electric energy into mechanical force. While electromagnets are more commonly used for electric motors, permanent magnets can be used as well. A magnet is placed in a conductive substance, and then the magnetic field yielded by the magnet turns another piece of equipment, which rotates the motor rapidly. Category 3: The magnet’s ability to convert mechanical force into electric force. Generators predominately use this ability. In contemporary times, electromagnets are more often used for power generating turbines, but permanent magnets still play a part. Very simply, two permanent magnets are placed opposite one another, with like sides facing. Their repelling forces rotate a turbine, which then turns a piece of equipment known as an armature. This churning armature generates electricity, which can then be transferred to other purposes. Category 4: The magnet’s ability to affect ion beams. Cathode-ray tubes, a type of vacuum tube for focusing electrons, use permanent magnets for aiming purposes. A ring of permanent magnets, alternating north and south poles, is on the end of an electron gun’s yoke, and these ringed magnets can be rotated to focus the beam for better reception or tighter focus. In all of these applications, it is important for the designed permanent magnet to be of high strength, resistive to corrosion, and resistive to demagnetization due to excessive heat. Manufacturers have gained experience in designing and producing permanent magnets to meet these needs for industries with permanent magnet and magnetic assembly applications. Permanent magnets today are 60 times as strong as they were about 90 years ago. Strong permanent magnets that can be used in industrial applications were developed in the 20th century, and Japanese and western European researchers and technologies have always played major roles in the development of permanent magnets. Neodymium magnets are the strongest known Permanent Magnet and as such are generally used in Permanent Magnet electrical machines. Neodymium is classified as a rare earth magnet however, they are not exceptionally scarce. The bulk of the current production is from China, whose government imposed strategic materials controls raising concerns in consuming countries, this has caused a high price tag. The price has dropped since the 2011 boom however the cost of electrical machines containing PM material still comes at a higher cost. It should be noted that due to the higher efficiency of PM machines, there will be a cost savings factor in fuel. Electromagnets are vulnerable to power failures, too much current can create short circuits rendering the magnet useless. AVRs also add another component in the system which decreases the overall system reliability as a result. Permanent Magnets face limitations in operating temperatures due to limitations in material properties, consequently they may require special cooling in very hot environments. PMs provide a constant magnetic strength utilising simple designs with no moving parts or electronics. Unlike the electromagnets PM machines are not susceptible to power failures and operate virtually maintenance free. The permanent magnet industry has grown in the last decade and is likely to continue this growth into the next decade because of increased usage of magnetic circuit components in a variety of industrial equipment and devices. Electromechanical devices (motors and permanent magnet alternators) constitute the largest market for permanent magnet materials. This market is growing rapidly. Applications related to permanent magnet direct current motors – brushless direct current (BLDC) and brush-type (PMDC) – and power generation (permanent magnet alternators) will be the largest usage segment of neodymium-iron-boron (NdFeB) permanent magnets, followed by voice coil motors (VCMs) in disk drives, because of the need for reduced size and higher performance. The third major usage segment is hybrid and electric automotive drives. Metallic magnets (combining neodymium-iron-boron, alnico, and samarium-cobalt magnets) dominate the market, followed by ceramic magnets (ferrites) magnets. In terms of regional demand, the market is large in the Asia-Pacific region, and it is growing at a fast pace due to rising demand from end-user industries, especially in countries such as China and Japan. The market is growing slowly in Europe, but will continue to grow at a significant rate in the North America. The U.S. is a net importer of permanent magnets, for as much as 60% of its consumption. This blog is intended to share a high-level view on permanent magnets. If you want to know anything more, please let us know. RFL Alternators Pty Ltd., has 25 years of research in the power generation industry backing its core strengths of innovation and energy conversion to produce world class patented products which are at the cutting edge of Technology today. The Focus of this blog is on the changing dynamics of doing business in Telecom Infrastructure. Let us roll back about 25-30 years. With the advent of Mobile Telephony across the world, the need for radio communication and mobile air waves grew dramatically. More often than not power to such remote locations always was a challenge and 100% of power supplied was through diesel Power Generators. Since, the towers had to operate without a minute’s downtime in the harshest of conditions, the power generators had to be robust, powerful and at the same time extremely fuel efficient. 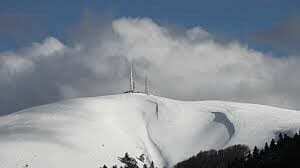 The first 2 requirements being the driving ones and the need for heavy AC power for Air conditioning units to shield the control units from the effects of nature, telecom companies preferred heavy power generators costing huge capital expenditure and consuming gallons of fuel, at the same time keeping a backup stock of prime power at their disposal to be used in rotation. The whole operation was uneconomical but necessary and was never put it into question because of the lucrative revenues and bottom line growths made by Telcos around the world. Mobile telephony in the new millennium is no longer associated with high voice calling rates and huge profits. The millennials in fact use the technology for far more complex applications and in much effective and economic communication which have depleted the bottom lines of the Telecom giants across the world severely. The good news however is technology for infrastructure is also growing at a similar pace. And the footprint of cell tower infrastructure has dramatically reduced. power generators consuming huge amounts of fuel. Technological advances enable telecom control units / towers to operate at higher temperatures thus eliminating the air conditioning load at site, creating significant energy savings and opening the market for DC generators. Presently 4.7 billion unique mobile subscribers and 5.7 billion projected by 2020. Telecommunications companies worldwide will invest over $1.4 trillion in the construction of new cell towers and equipment upgrades by 2020. Reducing energy cost presents a major opportunity to increase profit in an ever-shrinking unit subscriber fee base. Mobiles are replacing land lines as primary means of communications. Now the same level of reliability is being demanded of mobile network as to wired telephone networks in yesteryears. There is increased focus and awareness among nations for reducing carbon footprints, use of conventional fuel and energy sources to limit the dangers of Global warming. More than 90% of the current telecom towers use inefficient AC power. By 2030, it is predicted that 90% of the global population will have a smart phone. Australia – The large geography and remote towns and populations make it ideal for use of DC powered Generators. 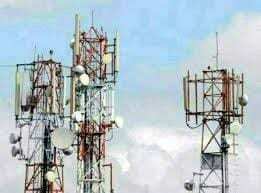 India – It is estimated that the telecom towers in India consume more fuel than all trucks running in the country. Africa – Large parts of the continent still suffer power outages for 12-18 hours. This makes even the most urban of sites needing highly fuel-efficient systems for tower operations. USA – With the role out of 5G networks, there will be need for better and efficient systems. RFL Alternators Pty Ltd., and our partners are constantly trying to change perceptions and challenge traditional thought process in the Energy Generation space. We are right in the middle of innovative projects in sectors like Telecom, Marine, Transport, Renewable Energy and Military. You can find about all of our DC PMAs in our new DC Range Products Page on the website. For more such interesting facts and to know more about all the interesting work that we are doing at RFL Alternators, please get in touch with us. 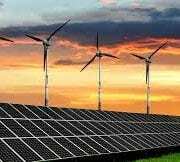 Renewable energy production and use has grown at an overwhelming rate – the acceptance and uptake of this technology has been greater than anticipated with countries continuing to set target dates for converting to 100% renewable energy . At least 30 countries generate more than 20% of their energy from renewables, and 120 countries have policy targets for longer-term shares of renewable energies. The European Sustainable Energy Vision outlines the transition of the energy supply and demand for the 27 EU countries to 100% renewable energy by 2050  which was then revised to 2040 . By the end of 2015, 23.7% of energy came from renewable sources: 16.6% from hydro power; 3.7% from wind; 2% from biomass; 1.2% from Photo Voltaic (PV) and 0.4% from geothermal, concentrated power and ocean . 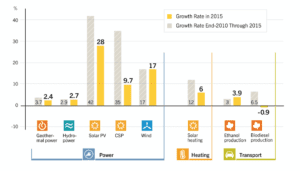 Figures 1 and 2 show that solar PV has the highest growth rate, however recently large scale CSP has been gaining a lot of attention, and per kw, wind power has the fastest growth . A number of challenges arise with the use of renewable energies. Firstly, energy is not ‘on demand’ and therefore may not always be available when required. This issue is more pertinent in terms of a source like solar, which is only available during sunlight hours. The practiced solution to this problem is simply to have a combination of different power generation sources, such as those listed in Figure 2.
concentrating solar thermal, hydro, geothermal, ocean from currents/waves, or biomass. 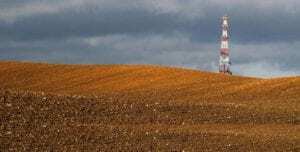 A second challenge with renewable energy is the land size required to sustain the planet’s energy needs. For a move to 100% renewable energy every step must be taken to design the smallest footprint. To do this energy systems must be designed to be as efficient as possible. The generator is no doubt a key factor in these systems and should be designed and retrofitted to meet the prime mover’s needs. These are all concepts well-known to Radial Flux Laboratories (RFL), however, not satisfied with this, RFL is pushing the envelope by modelling and developing new configurations tailored to improving the efficiency of generators to integrate seamlessly with the renewable energy source. Future posts will describe RFL’s sophisticated approach and design on developing generators that integrate with wind turbines, and the development of DC generators which have many advantages including combating harmonics produced by non-linear loads. By the end of 2015, 23.7% of energy was delivered from renewable sources with 3.7% of the total worldwide electricity supplied by wind energy, which is growing at a rapid rate of 17% per annum . Since 2011, the cost of wind generating infrastructure has fallen by 10%, making wind energy 14% cheaper than new coal and 18% cheaper than new gas . There are a variety of electrical generators on the market for use in micro-wind turbine applications. These include induction and synchronous machines. efficient than induction and wound rotor machines. As such, these generators have gained interest in replacing conventional machines with Permanent Magnet Synchronous Generators (PMSG). Until recently, wind energy converters have been designed for speeds from 750RPM up to 1800RPM, whereas wind turbines usually operate from 20RPM to 250RPM . 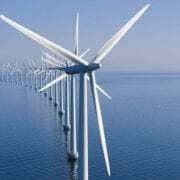 Consequently, a gearbox has been the link between the wind turbine and the generator. Gearboxes require maintenance, decrease efficiency, are noisy and are generally the first component to fail in the system. By increasing the number of poles in the generator, the electrical frequency increases and the gearbox can be eliminated. PMSG are able to have a smaller pole pitch and therefore more poles as only the leakage flux between the two magnets sets the limitation. Radial Flux Laboratories (RFL) has experience in modelling and developing machines utilising concentrated fractional windings which does not require an integer slot winding and hence allows for a higher pole count. There are advantages with both an inner and outer rotor configuration which is generally designed around the application. An inner rotor (meaning the stator is on the outside) is the most typical design and is generally chosen as the majority of losses are contributed to by the copper losses within the stator. As a result, designing with the stator on the outside gives better cooling properties for a higher efficiency. Furthermore, having the stator on the outside allows for larger slots, and consequently a more efficient or higher rated machine. A unique outer rotor design does bring a number of advantages though. For example, the larger rotor diameter allows for a higher number of poles, and the magnets stay cooler so the likelihood of demagnetisation is reduced. Additionally, the hub allows for the blades to be directly fixed to the rotor which results in a cheaper, simpler, and more integrated design. Dual stator machines are now being considered for various motor and generator applications. The dual stator is incorporated in synchronous generators to increase the power capability. Recently dual stators have been found to be useful as a part of uninterruptable power supplies, standalone power supplies, and generators of both ac and dc electric power . Another advantage is the reliability of having a dual winding generator. However, dual winding machines have also traditionally had the challenge of required heat dissipation associated with the inner winding. Recognising this, RFL has developed a unique design which transfers heat from both the inner and outer stator to the casing and cooling fins. RFL has also optimised the mechanical structure, efficiency and thermal properties. This design shows promise in wind turbine applications, where the generator is required to be sealed for increased reliability and service timeframes. As wind energy continues to grow it is paramount that wind turbines/generators are optimised for maximum efficiency and reliability. RFL has developed the most efficient and reliable generators on the market with the smallest footprint that can be tailored to meet the wind turbines design. C.Techies, “Renewables now cheaper than fossil fuels in Australia,” Environmental and Energy Study Institute, pp.1, Jan. 2013. The array of electrically powered systems used in the military has expanded beyond anticipation over the past decade and is continuing to grow at an unprecedented rate. Unfortunately, deployed power systems have not been upgraded to meet power requirements. The Army has an extremely rapid, mobile, spontaneous and agile deployment, making its power solution requirements some of the most complex. The Army currently relies on power generation from a series of wound rotor diesel generators ranging from single-phase 1.3kVA generators up to three-phase 60kVA generator sets. The current scenario for an Army deployment is to work the ‘power planning’ around each mission, this dictates the power generation and distribution to be deployed. When the mission capability increases, larger generators are needed to handle increased loads. As the mission decreases, smaller generators are required to replace the larger ones in order to keep the generator load balanced. This causes logistical problems and breaks the scalability and modularity requirements associated with an Army deployment. A well-known constraint on three-phase generators is load balancing techniques. The Army has been known to deploy with load banks in order to keep three-phase generators balanced and maintain a reasonable load. This is cumbersome to a mobile deployment force. Permanent Magnets Synchronous Generators (PMSG) like those developed by RFL Alternators have significant advantages over the conventional wound rotor generators. Firstly, load balancing. Although load balancing is recommended for PMSG technology and should be practised, it does not bear the importance that it does on traditional wound rotor generators, and certainly does not need to be as closely balanced. Due to power demands in vehicle mounted configurations, recently the Army has been fitting vehicles with an Auxiliary Power Unit (APU). This APU has been a DC PMSG, which was chosen for two main reasons. Firstly, it eliminates the need for the vehicle to comply with strict high voltage standards and secondly, nearly all electrical equipment runs off DC voltage, so the need for rectification and voltage step-down is eliminated thus saving efficiency. To meet these demands RFL Alternators have recently developed highly efficient DC PMSGs, which have an optional 24VDC and 48VDC output. RFL generators are designed with an embedded permanent magnet synchronous generator using neodymium magnets. This clever design leads to highly efficient robust generators. They are smaller in size and lighter in weight than traditional wound generators and don’t have the need for complex electronic components – this dramatically increases reliability. 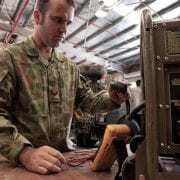 Our next post will reflect upon RFL Alternators have teaming up with an Australian company specialising in remote area power and independent energy to provide rugged and reliable generator sets to the Australian Army. European legislation to phase out vehicles equipped with the internal combustion engine has led to a shift in the market – making way for Electric Vehicle technology to be embraced. Permanent Magnet BLDC drives have been identified as the most promising technology to provide the attributes required for modern Electric and Hybrid Electric Vehicles. Awareness of environmental problems is growing dramatically throughout the world. This is leading to a tremendous interest in developing non-polluting Electric Vehicles (EV) and Hybrid Electric Vehicles (HEV). Vehicles equipped with the traditional Internal Combustion Engines have been in existence for over a hundred years. Although ICE vehicles have been improved by modern automotive electronics technology, they only offer around 20% efficiency . Electric vehicles are one of the most promising technologies that can lead to significant improvements in vehicle performance, energy utilisation efficiency, and emission reductions. Multiple countries have already acted on enforcing a ban on combustion engines, initially led by Norway for 2025. Other European countries include Sweden, France, Germany, Belgium, Switzerland and the Netherlands whom are considering a phase-out by 2030. This is not only in order to cut CO2 emissions but also to reduce the European Union’s (EU) dependence on Russia. Outside of the EU, phase-out of ICEs also seems likely in Japan which is home to the world’s top-selling electric car, the Nissan Leaf . The technologies of all component hardware are technically and markedly available on the market. At present, almost all of the major automotive manufacturers are developing either HEVs or fully EVs. There is a large variety of electric motors that come in a number of topologies, the key being to balance high efficiency, reliability, and Size Weight and Power (Swap). 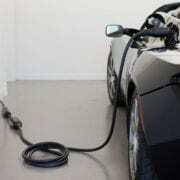 Presently the three most common topologies used in EVs are Brushed DC, Brushless DC (BLDC), and AC induction. With the advent of high-energy permanent-magnet (PM) materials, PM motors are becoming increasingly attractive. Being continually fuelled by new machine topologies and control strategies, PM BLDC drives have been identified to be the most promising to provide the characteristics needed for modern EVs and HEVs. stator back iron. This results in a larger and heavier machine . In recent years, attention has been drawn to Interior Permanent Magnet (IPM) synchronous motors. This is due to their simple structure, robust configuration, high power density, easy heat dissipation, and suitability for high speed operations. The IPM motor takes advantage of flux focusing, which is performed by angling the magnets to gain a higher flux density in the air-gap than that of the PM flux density. The IPM topology has the highest power density and highest efficiency among all types of motors. 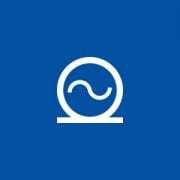 Through flux focusing flux leakage is minimised up to as much as 20%. Furthermore, IPMs have a more robust rotor than that compared to other PM motors without the need of additional retainment and lower cost rectangular magnets  . Regenerative braking can be considered a requirement in EVs it can increase the vehicle range by up to 15% . Regenerative braking is easier with a PM motor because the magnets do not need to be energised. This results in less rotor heat generated with PM motors compared with induction motors which require a well-suited cooling system . This gives PM motors a higher efficiency for the amount of kinetic energy that can be recovered. Without the rotor winding PM motors also produce a unity power factor. It is however noted that attention must be given to demagnetisation of higher continuous temperatures in PM motors, when designed with NdFeB magnets . Legislation throughout Europe has begun to force EV into the market, and it is expected that most of the world will follow suit. This is leading to a large production of EVs. Currently IPM motors have the highest efficiency, smallest size, lowest weight and are the most efficient in recovering the vehicle’s energy in the form of regenerative braking. Due to high efficiency and smaller lighter motors, the vehicle will have an extended range on the same size battery bank. Electric Vehicles will also play a major role in the dynamics of how we generate, store and use energy in the future. Electric Vehicles provide an added benefit to existing energy grids – Off Peak Recharging. An EV can be recharged during the night, when the energy demand on the grid is low. This is similar to the off-peak tariff used to heat residential hot water systems. As we move towards a more distributed generation model in the future, the additional storage capacity of an Electric Vehicle has significant potential. Peak demand as mentioned above can be capped, and we will have the ability to consume energy at off-peak times, thus removing the expensive energy peaks currently experienced. C. R. Ferguson and A T Kirkpatrick, Internal Combustion Engines: Applied Thoermosciences, Third Ed, Colorado University. John Wiley & Sons Ltd, 2016, pp. 2. For efficiency and maximum performance 3 phase alternators are the most common alternators on the market, however due to the very nature of the design they are required to work at a balanced load. Unfortunately, it is almost impossible and unrealistic to run 3 perfectly balanced loads. Any variation on any of the loads will cause unbalance in the alternator. An unbalanced load can cause a number of unwanted effects on a alternator which can in-turn affect the load. The world is becoming more reliant on electrical power. Electrical power is required for a primary source of energy, back-up systems, military deployment and disaster relief. As technology increases the power demand grows, and systems can-not afford to go offline. This drives the requirement to have larger and more reliable generators. Larger generators become unpractical and a single point of failure is evident. RFL have developed Interior Permanent Magnet Generators (IPMG) that are designed to allows a series of generators to run in parallel.